It’s halfway through the Fringe and I’ve won. I got a call from Fringe CEO John Fringe the other day (it was an 0843 number) and he proudly told me, in his inimitable Scottish brogue, that my show had impressed him so much that I had won the Fringe. Note that this is a different thing to the Foster’s award, it’s a whole other award that John Fringe takes sole responsibility for, and it hasn’t been won in decades as nothing’s been good enough. But now that I’ve managed to impress him with my show it means that next year the Edinburgh Festival Fringe will officially renamed the Edinburgh Festival Joz Norris and every show will be performed by people wearing masks of my face. A lovely honour. Anyway, it’s time for my latest photo blog. Everybody’s favourite retired comedian and Den of Geek editor Pete Dillon-Trenchard recently told me, having read my second Fringe blog, that my camera lens needs a wipe. This picture, and some of the others in this blog, were taken before he sent me that memo so they’re still a bit bleary. Sorry guys. Anyway, here’s some clowns posing for a press photoshoot on the theme of “How many clowns can you fit into a car?” Unfortunately, no press turned up and most of the clowns who were supposed to attend overslept as well so the answer to the question turned out to be “About four or five. The normal number.” PR stunts that don’t quite gather momentum are becoming my forte what with last year’s hilltop duel and this year’s Silent Singalong. 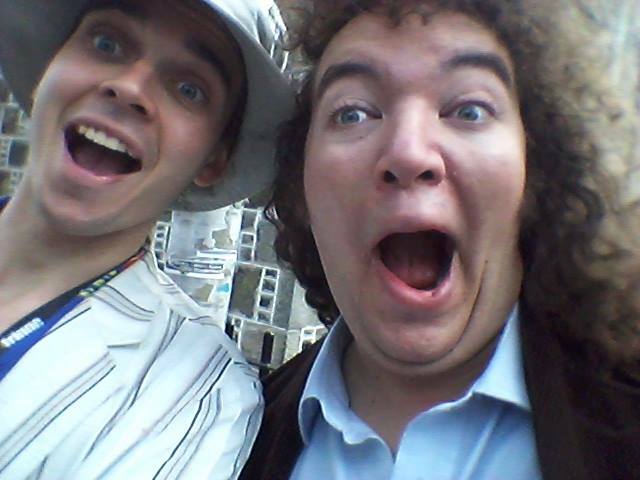 Still, what better way to cheer oneself up after a PR stunt gone awry than with a lovely selfie? 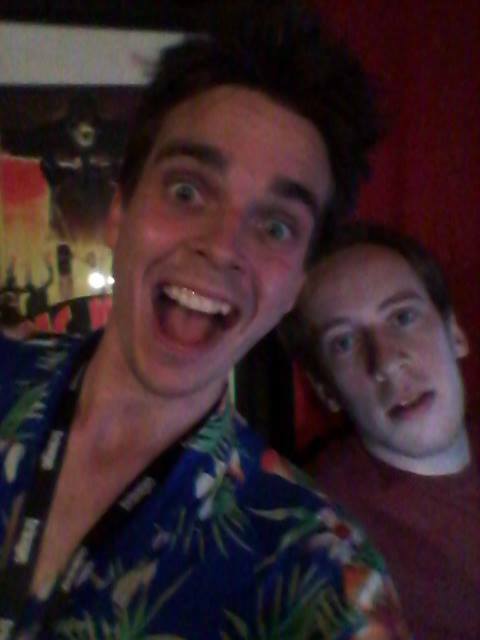 Here’s me and cheeky chappy Luke McQueen, really loving life and kicking back with some fun. This photo really shows off my snaggle-fang, which is good as I’ve realised how important it is in the comedy business to have a USP. I’m pretty certain I’m the only snaggle-fang comedian in the business, so let’s get a few more pictures of this beauty out there. 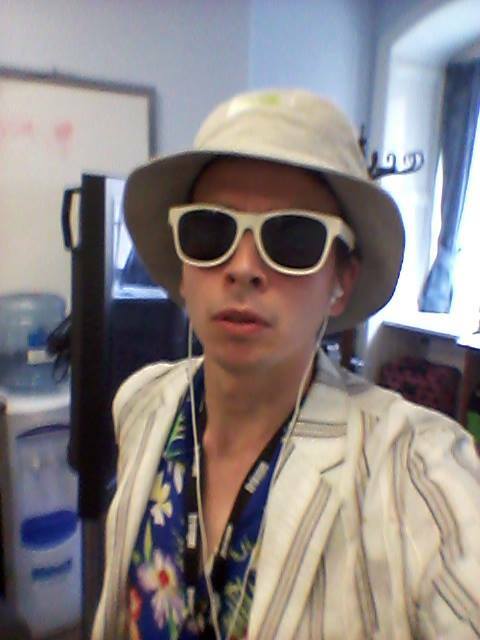 Here’s a picture of me dressed up as Hunter S. Thompson by accident. Basically, I just threw on a bunch of stuff from my wardrobe and this happened. 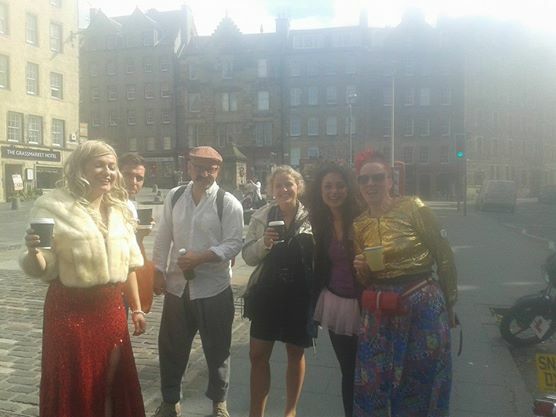 Quite by chance, there are two plays on at the Fringe about Hunter S. Thompson, so this accident resulted in a lot of people coming up to me asking for information about the plays. Obviously, I directed them to my own show, resulting in a number of thoroughly confused audiences. One of these plays I actually saw last night, and it’s about that time Johnny Depp lived with Hunter S. Thompson. It’s great, and I’d like to see a string of sequels about that time Nicolas Cage lived with Bukowski, or that time Ginsberg and Jim Carrey spent a year in a Premier Inn. 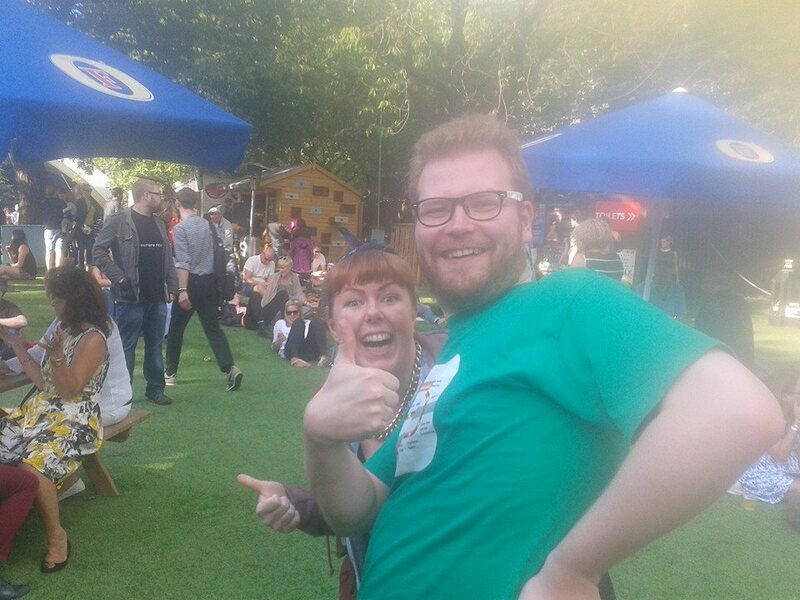 This is a lovely picture of funny-haired Will Seaward posing with a cardboard cutout of me. These have proven to be a valuable investment on my part, as people all over Edinburgh seem to really love them. That said, it is depressing to be slouching home late at night and end up seeing a life-size replica of yourself lying in a gutter. It feels like foreshadowing. One more selfie, and this one I don’t even have anything funny to say about. Basically, Gareth Morinan threw a fit that I didn’t include this photo of him in the last blog, so here it is, in all its humourless banality. Are you happy, Gareth? 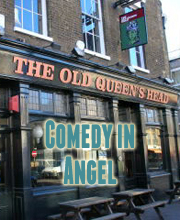 Are you happy to have made it into my Laugh Out London Photo Blog via the most boring photo yet to be included? You don’t even look happy to be there. Make an effort, Morinan. What’s in the box? What’s in the box!?!?!? 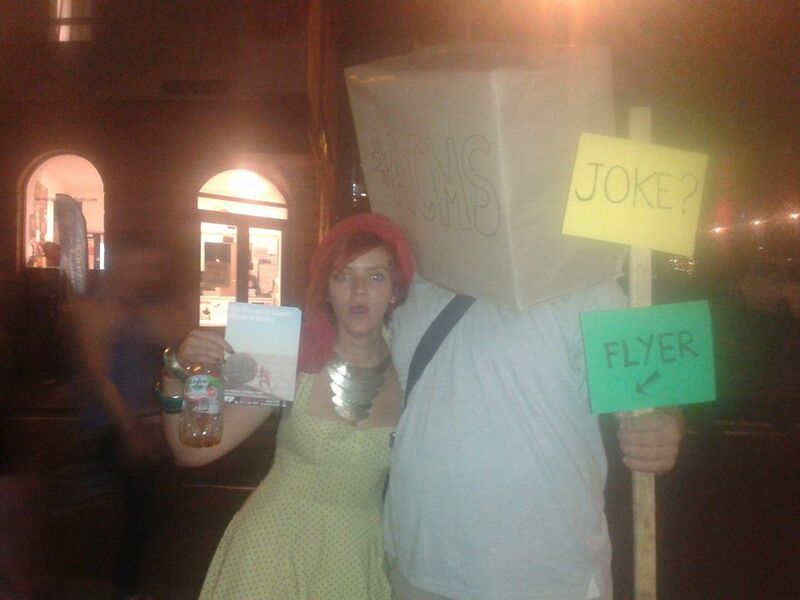 Here’s pirate journalist Mickey Carroll posing with an actual box, which was helpfully flyering for the Alternative Comedy Memorial Society. I’ve met a lot of boxes since coming to Edinburgh (boxes of flyers, boxes of cereal, you name it, they’ve got it up here), and this is the first one I’ve met that’s shown a real commitment to getting audiences into a show. Only after this picture was taken did we learn that the box is actually the superhero alter-ego of Mark Dean Quinn, but I’m not supposed to have spoiled that here. 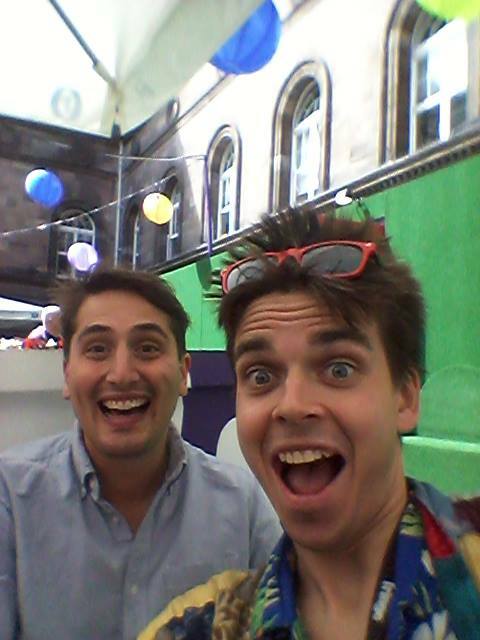 That’s right, guys – this Fringe I actually got to MEET Laugh Out London! Here’s Laugh Out London co-head honcho Tom Meek and wife, relaxing in Assembly Gardens. It was a real honour to finally meet the people in charge of this excellent blog who have provided so much support and love over the years, and an even bigger surprise to learn that it was Tom Meek who runs it, considering I’ve actually known him personally that whole time. I now understand why he always messaged me about performing at Laugh Out London’s comedy nights and doing interviews with Laugh Out London, but sometimes it takes a direct meeting like this for all the dots to join together. 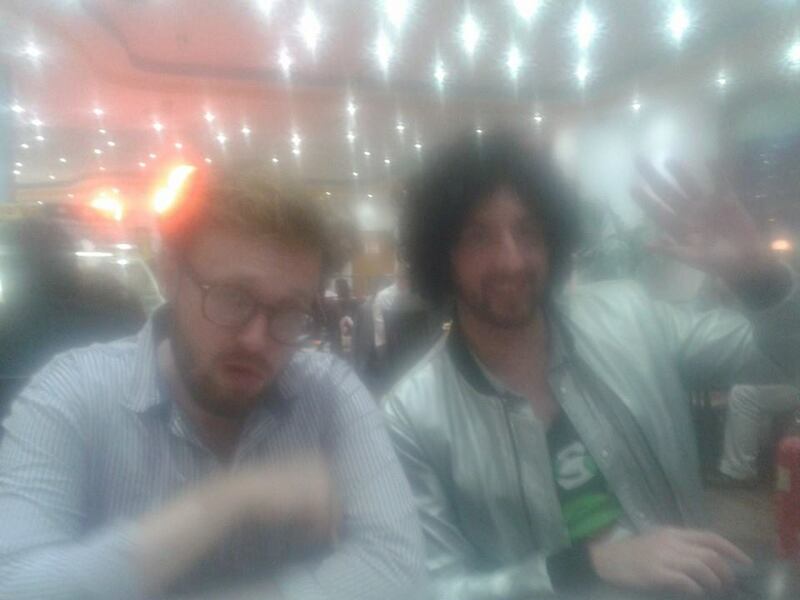 Here’s John Kearns and Matt Highton enjoying a dinner with me under a starry sky. Sometimes the hustle and bustle of Edinburgh can be a bit much, and when that happens me, John and Matt like to head out into the countryside around Edinburgh, climb the highest hill and get back to nature. We breathe in the cool air and then reconstruct, at great expense and effort, an exact replica of Edinburgh’s Mosque Kitchen, leaving the roof open to have access to the stars in the night sky. A really romantic Edinburgh tradition that gets the pulse racing. After this was taken, we all kissed. Finally, it wouldn’t be a proper Laugh Out London photo blog if I didn’t include a photo of Beth Vyse eating something. 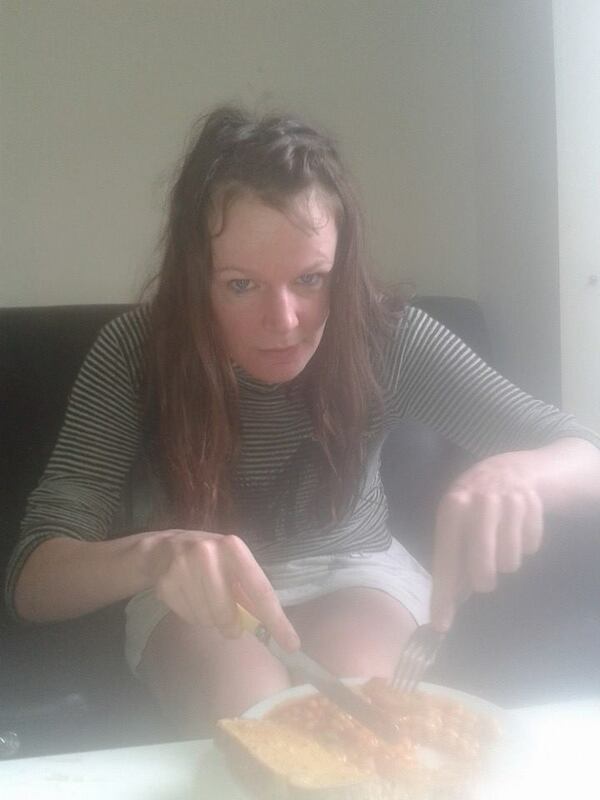 Having enjoyed the baked beans I treated her to back in Blog 1 so much, Beth has started eating plates of baked beans constantly, at every minute of the day, even while flyering and while performing her show. It’s my honour to treat you all to another exclusive shot of her enjoying her favourite food.